Mix well all purpose cream, condensed milk, cream cheese and calamansi juice. Add food coloring until desired color is achieved. Set aside. Spread 1/4 cup of calamansi-cream mixture into the bottom of a square glass or aluminum container. Arrange Graham crackers on top of the cream. Add a second layer of the cream. Finish with another layer of Graham crackers and the rest of the cream. Decorate with kiwi wedges and crushed Graham crackers on top if desired. 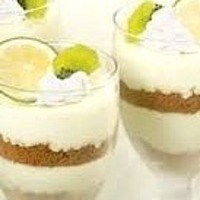 this is certainly and easy to do and enjoyable to eat desert. thank you john. I've done this and it is very nice. I tried it with mangoes too which is very easy to find here. Tasted great! This looks so refreshing! Thanks for posting - I'm going to give this a try! Would that be a Kalamansi Lime???? I don't know what a calamansi is.